Disclosure: Overnight stay & meals provided for review. All opinions are mine! To charter: to adventure, to go forth and explore. Even though I was born & raised here in Seattle, I feel like I’m re-discovering my city every day. It’s growing and changing so much! While I love exploring new places, it also makes me want to re-discover what’s been here forever. 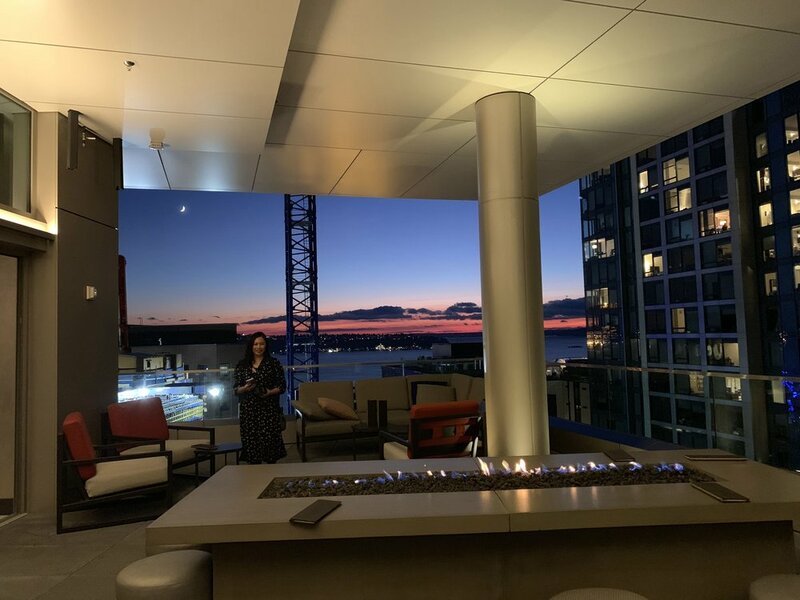 We got to do both of those things last weekend on a staycation adventure at the brand new Charter Hotel Seattle. 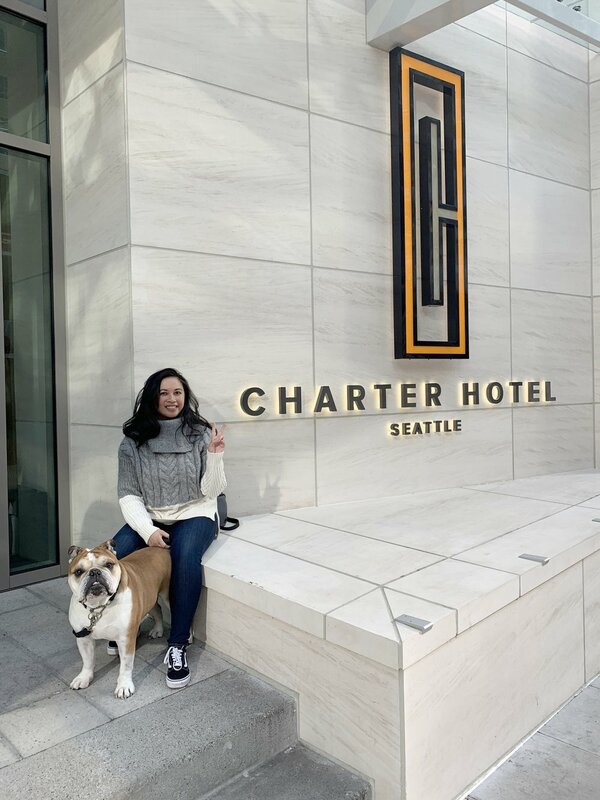 Located just a block from Pike Place Market on 2nd & Stewart, the Charter Hotel has the independent feel of a boutique hotel as well as the quality you’d expect from the hotel brands you know and love. There are 229 modern, thoughtfully-designed guest rooms in the 16-floor hotel, with 13 one-bedroom suites, a spacious fitness center with sauna & steam room and over 6,000 sq. ft. of event & meeting space. You already know that as soon as I walked into our suite, I put on the plush (hooded!) bathrobe, pretended I was a breakdancer & did windmills on the marble bathroom floor, jumped on the bed, and found the always-on Harry Potter marathon on the 50-inch HD TV. Haha! Looking for a great pet-friendly hotel? From the moment we set foot in the Charter Hotel, Dougie was treated like a KING. Treats, cuddles, and lots of love and attention from all of the front staff (literally everyone). A plush doggy bed, dishes, and even more treats awaited Dougie in our room. He even got the V.I.P. 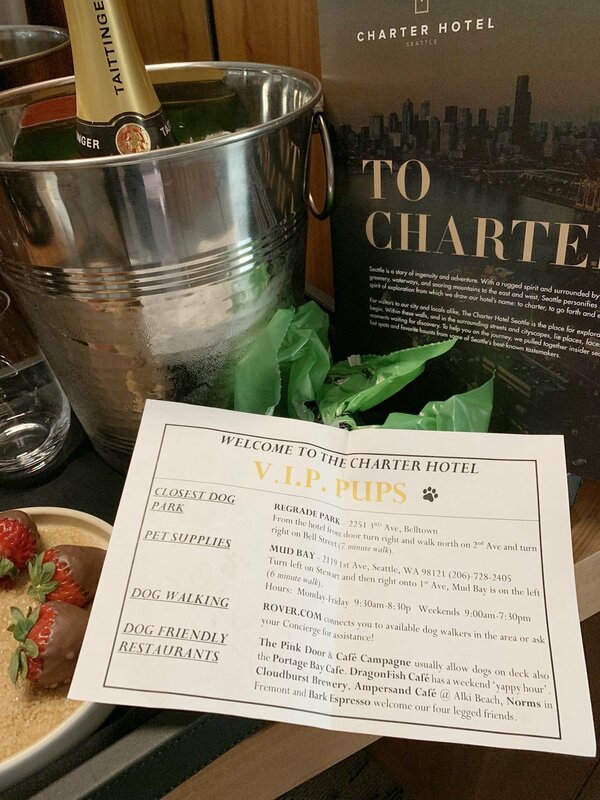 (very important pups) recommendation list curated by the hotel - for humans, there are also curated itineraries from some of Seattle’s tastemakers in each room also! We settled in, then headed up to the Fog Room to watch the sun set while enjoying some drinks & bites. I’m honestly surprised there isn’t an abundance of rooftop bars in the city, especially after all the ones I found while doing my London research. The Fog Room was smartly designed with ample indoor and outdoor (covered) space, so you can enjoy the view no matter what the weather! I highly recommend the Lucian Bacchanal (aged rum, mezcal, lime, & abby’s mix), the seared foie gras, bacon wrapped dates, and togarashi & sesame fries with yuzu aioli. Oh, and oysters, always! After the sun set, we headed down to Patagon for dinner. Patagon brings together Argentine-inspired fare with Pacific Northwest ingredients, with the highlight of the room and the menu centered on the open grill. We shared the empanaditas, flank steak, sweet potatoes, and agnolotti over a couple of glasses of red wine. A perfect way to end the night! So much so that we can’t wait to go back for date night again soon. We took advantage of the quiet Sunday morning to take a stroll through Pike Place Market. The Market can be overwhelmingly touristy most of the day, but in the morning the crowds are minimal. I love getting a pastry from Le Panier and watching the vendors set up; it’s like having the Market to yourself for a few moments! We had a few more hours to kill before check-out, so we took advantage of the fitness and wellness center with a quick workout and some sauna / steam room time. A good sauna & steam room session is one of my favorite ways to relax and unwind; it was the perfect way to end our staycation. Thank you to the Charter Hotel Seattle team for having us, and for treating us like royalty! If you’d like to book your own stay or a date at Fog Room or Patagon, check out the website. Let me know if you have any questions!